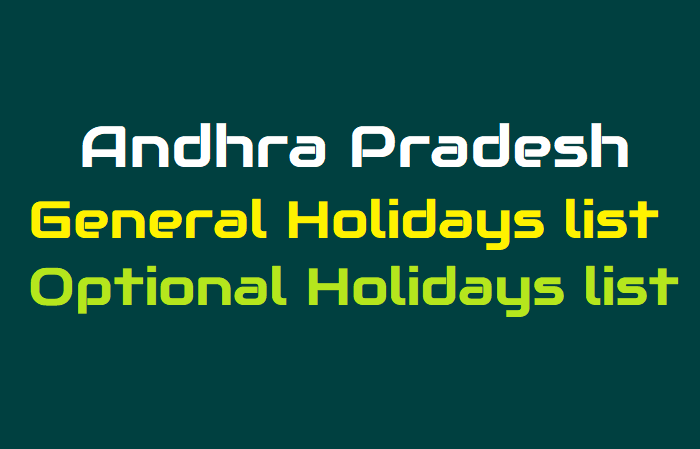 HOLIDAYS, General Holidays, Optional Holidays for 2019, General Holidays and Optional Holidays for the year 2019; Download General Holidays List, Download Optional Holidays List, Telangana Holidays GO Download. HOLIDAYS - General Holidays and Optional Holidays for the year 2019 – Declared. 1. The Government of Andhra Pradesh direct that the days specified in Annexure-I shall be observed as General Holidays by all the State Government Offices excluding the holidays falling on Sundays shown in Annexure-I (A) and Optional Holidays shown in Annexure-II except the Optional Holidays falling on Sundays shown in Annexure-II(A) during the year 2019. 3. In addition to the above mentioned General Holidays in Annexure-I, the State Government employees may avail themselves of Optional Holidays not exceeding FIVE during the year 2019 on festival/occasions specified in Annexure-II to this order, at their option and irrespective of the religion to which the festival pertains. Permission to avail any of these holidays shall be applied for, in writing in advance and shall normally be granted by the Superior Officers competent to grant casual leave except when the presence of an individual employee is considered necessary in exigencies of Government work. NOTE:SRI RAMA NAVAMI/DR.B.R. AMBEDKAR’S BIRTHDAY (14.04.2019)/TAMIL NEW YEARS DAY (14.04.2019) HOLIDAY FALLING ON SAME DAY OF SUNDAY. HOLIDAYS, General Holidays, Optional Holidays for 2018, General Holidays and Optional Holidays for the year 2018; Download General Holidays List, Download Optional Holidays List, Telangana Holidays GO Download. Both the General Holiday for Durgastami and O.H for Maharnavami have occurred on 17.10.2018. The following festival occurs on 2nd Saturday and Sunday during the year 2018.